Description: The New Yorker is a widely known for its political commentary and coverage of New York culture. The publication's reach extends far outside NYC. The magazine is read around the globe. It is also known its iconic cover art. The weekly magazine is published by Conde Nast. Needs: The New Yorker is looking for fiction and poetry. They are also seeking short humorous fiction for the daily Shouts & Murmurs section. The magazine also publishes cartoons which can be submitted through Submittable. The guidelines say they do not accept unsolicited nonfiction. 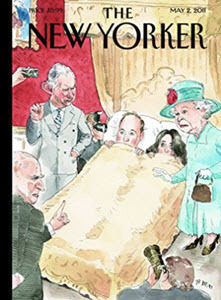 Payment: The New Yorker is a competitive paying market but does not list exact rates online. Tips: The New Yorker fiction editor Deborah Treisman told The Stranger that everyone in the fiction department writes an opinion about a story being considered for publication. A published story may not be liked by everyone. Treisman also discusses fiction submissions in an interview on forward.com. She says there is no "one thing" or "trademark piece" to get published in the magazine. She says a story must "achieve on its own terms." Deborah Treisman also answers a few questions in a FAQ from 2008 posted on newyorker.com. How to Submit: Fiction and Shouts & Murmurs submissions can be submitted to the appropriate email as a PDF attachment (see the guidelines). Stories can also be submitted by mail. Poetry can only be submitted through the New Yorker's Submittable page.